(News Investigators) /The Police Joint Operation Team says it has repelled ambush attacks from armed bandits at Mahanga Forest in Birnin Mogaji LGA of Zamfara State. The incident which took place at about 4.00pm on Thursday 29th November resulted killing of 104 bandits. 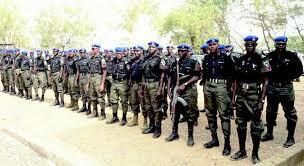 The Police also destroyed over 50 bandits’ hideouts in 3 camps and recovered over 500 cattle 79 sheep. The Police in a statement by its spokesman, Jimoh Moshood, however, said it lost a Policeman during the attacks. The Police Team has restored normalcy and peace in the affected areas. The statement said the Inspector General of Police on 9th November, 2018, deployed Police Joint Intervention Team of about 1000 police personnel comprising the 7 Units of Police Mobile Force (PMF) headed by an Assistant Commissioner of Police, Counter Terrorism Unit (CTU), Federal Special Anti-Robbery Squad (FSARS), Police Anti-Bomb (EOD) Squad, and conventional policemen to Zamfara State to rout-out, arrest and prosecute armed bandits, vicious kidnap for ransom and cattle rustling gangs operating in some parts of the State. “The Team have recorded significant progress in the arrest of more than Eighty-Five (85) suspects, recovered Twenty Seven (27) AK47 Rifles and Fifty-Two (52) locally fabricated rifles and other dangerous weapons, Two Hundred and Sixty-Nine (269) Cattle, One Hundred and Nine (109) Sheep already handed over to their owners. “Consequent on the ambush attacks on the Police Joint Team which were successfully repelled by the Police Team, the Inspector General of Police yesterday, 29th November, 2018 deployed DIG Department of Operations to Zamfara State to be the overall commander of the Police Joint Intervention Force and add new impetus to the Operations. “The DIG has already arrived in Zamfara State overnight with Hundreds of Police Special Forces Personnel, Counter Terrorism Units (CTU), additional Police Mobile Force (PMF), Federal SARS Personnel, Three (3) Surveillance Patrol Helicopters and crew members to Zamfara State to coordinate the operation to completely rout-out all Armed Bandits from Zamfara and other contiguous States. “The DIG, Department of Operation and the Police Joint Team have been mandated to also coordinate the Commissioner of Police, Zamfara State and personnel of the Command to sustain and restore lasting peace throughout Zamfara State. “Parade of some of the suspects arrested before the media and public will be done soon. “Members of the public with any information or in distress in any part of Zamfara State should call the following Police Joint Intervention Control Centre through the following numbers 08037025670, 08033210966, 08033312261, 08123829666, 09053872244, 07082351758, 08091914752,” it added.